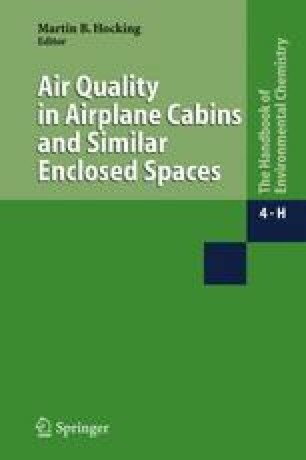 The cabin of an airplane is a specialised working environment and should be considered as such. The oils and hydraulics used in airplane engines are toxic, and specific ingredients of such materials are irritating, sensitising and neurotoxic. If oil or hydraulic fluids leak out of engines, this contamination may be in the form of unchanged oil/fluid, degraded oil/fluid from long use in the engine, combusted oil/fluid or pyrolised oil/fluid, in the form of gases, vapours, mists and particulate matter. If leak incidents occur and the oil/fluid is ingested into bleed air and is passed to the flight deck and passenger cabins of airplanes in flight, aircrew and passengers may be exposed to contaminants that can affect their health and safety. Where contamination of air in the flight deck and passenger cabin occurs that is sufficient to cause symptoms of discomfort, fatigue, irritation or toxicity, this contravenes the air quality provisions of Federal Aviation Regulations, most notably FAR 25.831. Symptoms of immediate or short-term nature and reported by exposed staff in single or few leak incidents are consistent with the development of irritation and discomfort. Symptoms of a long-term nature (that is, sustained symptoms for at least six months) reported by some exposed staff following small to moderate numbers of leak incidents are consistent with the development of an irreversible discrete occupational health condition, termed aerotoxic syndrome. Features of this syndrome are that it is associated with air crew exposure at altitude to atmospheric contaminants from engine oil or other aircraft fluids, temporarily juxtaposed by the development of a consistent symptomology including short-term skin, gastro-intestinal, respiratory and nervous system effects, and long-term central nervous and immunological effects.